Chinese online travel giant Ctrip reportedly invested more than $100 million in overseas tourism service ToursForFun (report in Chinese). 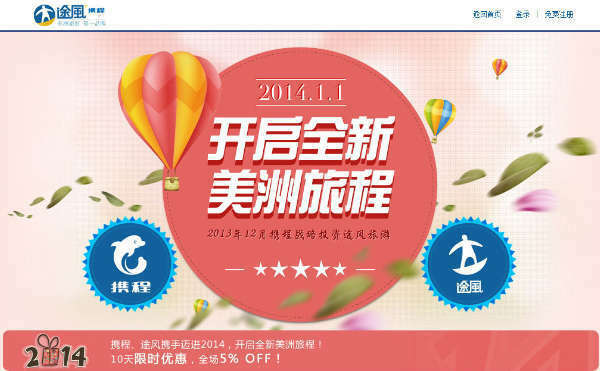 According to official website of ToursForFun, the company will become part of Ctrip’s North American branch, which was set up in last November. Founded in 2006, ToursForFun is a thriving online travel supplier dedicated to providing online purchasing experience for all travel needs. It is focused on overseas tours and vacation packages in North America, Europe, Asia, Australia & New Zealand, and South & Central America. The number of China’s outbound travelers is expected to surge 13% year-on-year to 110 million in 2014, according to data released by 2014 National Conference of Tourism Industry. The overseas travelling revenue is expected to climb 3% year-on-year to $49.2 billion (source in Chinese). In addition to acquiring companies that have established presence in foreign markets like ToursForFun, Ctrip’s newly launched online ticket platform included tourist attractions in over 30 countries or regions outside China. Moreover, the company also launched overseas private tour platform with international car rental companies in a bid to tap overseas tourism market.